– I mention “Standard Vietnamese” orthography only because I have encountered more non-Standard_Viet orthographies written with this system (Mường, Tày, Coong, etc) and know that there’re still non-trivial phonological exceptions even in Std Vietnamese, e.g Pleiku. Yes, majority cases will find these trivial, but I prefer better architecturing that isn’t potentially excluding. – I am unsure of the absolutism in the claim that tone marks are _always_ written after a syllable/string/phrase has been completed. I can remember my teacher writing tone marks in linear/visual order as well as syllable logical order as well as a rare memory of once all letters in a string had been written, where the last case was IIRC a test for us students. For cursive handwriting, writing of diacritics after a string is done makes sense, but, not necessarily so for print handwriting. Given that this keyboard is seemingly primarily engineered for a smartphone / mobile device / virtual keyboard experience, it’s an amazingly neat first-pass. 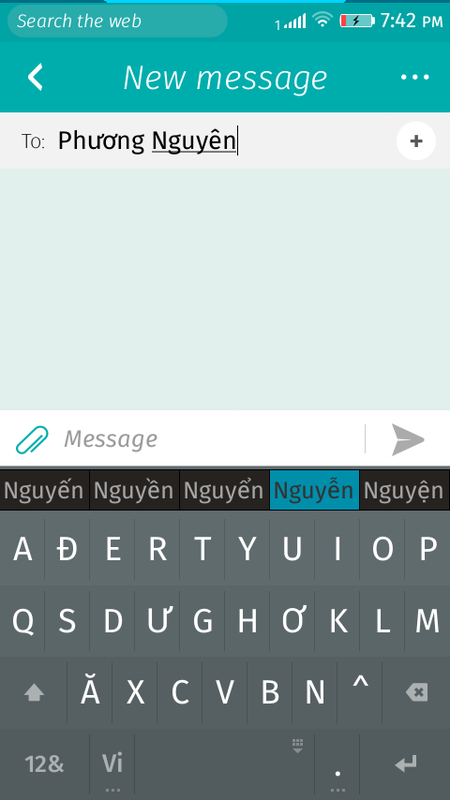 I’ll note that you can still type ‘Pleiku’ with this keyboard layout. The keyboard app will notice that it doesn’t conform to usual Vietnamese rules, but that just means it won’t try to generate tone candidates. You can still type the word. You only have to switch to a different layout if you want to type a word with F, J, W, or Z. My understanding is that when foreign words are borrowed into Vietnamese, those letters are usually replaced (F -> PH, J -> GI, W -> OU, Z -> D). I’ll also note that Firefox OS makes switching keyboard layouts easy. Toggling between AZERTY and AĐERTY is no more difficult than tapping a shift key. You are correct that this keyboard isn’t suitable for typing any of Vietnam’s numerous minority languages, like Mường or Tày. But let’s be clear, those languages are not Vietnamese. (Well, they are Vietnamese in the sense that they exist in Vietnam, but they are not the language known as “Vietnamese”. Tày isn’t even related to Vietnamese.) You will not find articles written in Mường or Tày on the Vietnamese-language Wikipedia. I’m not opposed to seeing support for languages like Mường or Tày, or indeed any of Vietnam’s 53 official minority languages, but that becomes a much more difficult undertaking (starting with the difficult question of “which languages do we support and why?”) and it wasn’t part of the requirements for this keyboard. If it makes you feel better, Firefox OS will have support for installable 3rd-party keyboards. Well, I didn’t say always. But I was under the impression that it was usual, and I’ve noticed it when people spell words aloud too. e.g. Nước will be spelt aloud as N-Ư-Ơ-C-dấu-sắc. But it doesn’t matter. The point is that it’s not clear when the key for a tone mark should be pressed. 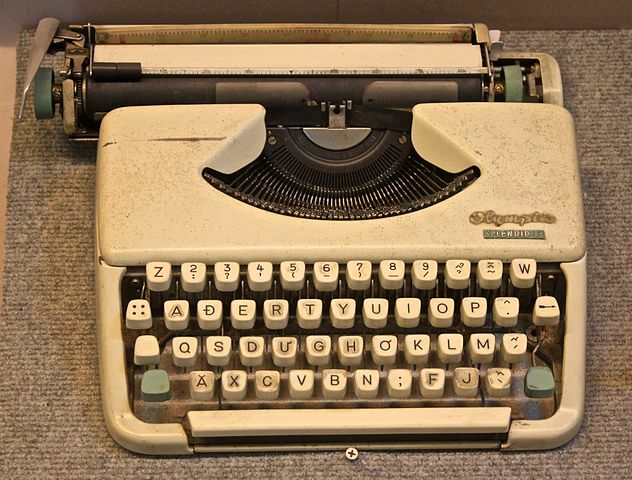 Back in the days of typewriters, tone marks were typed before the main vowel, so that makes three places a user might expect to type the tone mark (before the main vowel, after the main vowel, and at the end of the word). I thought about allowing a tone mark to be typed in all three places, but I wasn’t sure what the user experience for that would look like, and I also really wanted the tone mark key to automatically insert a space (which I couldn’t do if the user could type the tone mark in the middle of the word). In any case, I think generating tone candidates is a simpler experience. Thanks for your comments, Patrick! Great post, thank you for the detailed write-up. It’s fascinating to learn about the intricacies of the Vietnamese writing system. I also liked the fact that you found some inspiration in an old-school typewriter. If I understand correctly, in Vietnamese there might be only one tone marks over a single word (out of five). Does this mean that for each word the user inputs, the suggestion engine is guaranteed to show at least five suggestions, one for each tone mark? Plus any number of other suggestions which offer actual spelling fixes. Would it make sense (given enough screen estate) to have two suggestion bars: one for the variants of the current word with tone marks and another one for spelling suggestions? > Does this mean that for each word the user inputs, the suggestion engine is guaranteed to show at least five suggestions, one for each tone mark? Usually five. For words that end in a stop consonant (c, ch, p, or t), there are only two options. > Would it make sense (given enough screen estate) to have two suggestion bars: one for the variants of the current word with tone marks and another one for spelling suggestions? The IME doesn’t currently attempt to fix spelling, but that would be an interesting future direction. I don’t know if we’d need two bars… we might be able to get away with one bar. If the user types something that isn’t a valid Vietnamese syllable, we could show the closest valid syllable, and all tone variations of that syllable. It would provide some typing assistance while not using too much screen real estate. I might have a stab at that if I have some time. one key expectation i would have from this is that what it eventually drops into your content area should be Unicode text where the characters are properly normalised. You didn’t mention that. Does it? That would be very helpful. I don’t normalize the text, but because I use precomposed characters only (no combining marks), the result should be identical to normalization form NFC.